Shrimp (Prawn) Cocktail, American style, Thyme for Cooking starter. You'll need a bit of extra time if you have to peel and cook the shrimp, 10 minutes to peel and 5 to cook. The amount of horseradish and optional hot sauce is entirely a matter of taste. If necessary clean shrimp and cook in an inch of water to which 6 peppercorns and a dash of lemon have been added, for 2 - 3 minutes, just until they turn opaque and start to curl. If already cleaned and cooked just rinse and pat dry with paper towels. Mix ketchup, lemon and 2 tbs horseradish. Taste. Add more horseradish, ketchup, hot sauce, lemon, to taste. Spoon into small bowls or cups, or directly onto plates. 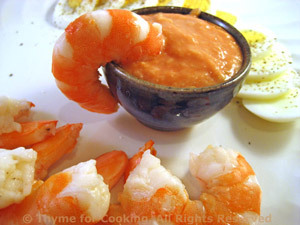 Arrange shrimp, eggs around sauce and serve.